Today you’ll learn the analysis of 50 kVA Distribution transformer using Simulink Tool in the MATLAB. 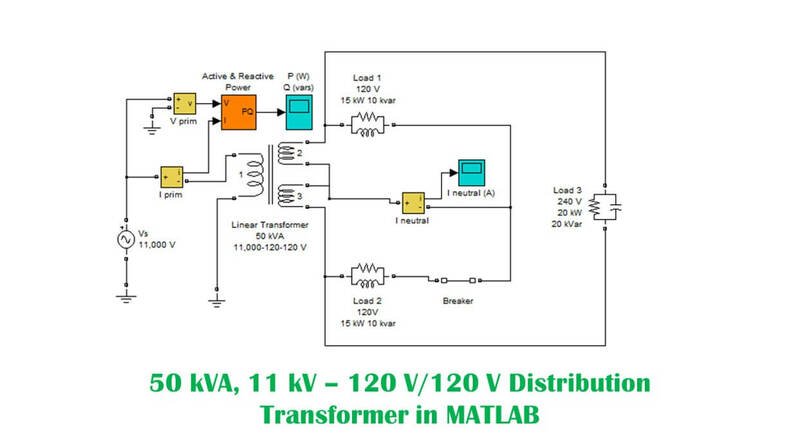 Download MATLAB model file for 50 kVA distribution transformer. The 11 kV input is supplied using an AC voltage source. Voltage/Current is measured and by using Active/Reactive measurement block, the P and Q are measured. The linear transformer is a two winding transformer which steps down the input to two 120 V outputs. Two 120 V, 15 kW 10 kVAR loads are connected across the output terminals. A current measurement tool is also added in the neutral. A third load (RC) connects in parallel to the overall secondary. Rating ( 20 kW, 20 kVAR ). A breaker is connected to the circuit whose switching time is set to 0.1 s.
Play the simulation and open P, W display block. Originally the power (W) is 50 kW, However after switching at 0.1 s. The power decreases to 35 kW. Underbalanced condition the current flowing through the neutral is almost zero. However once unbalanced condition occurs the current starts flowing through neutral. Download the 50 kVA distribution_transformer_file. Run it and observe the output. Change the switching time of breaker from 0 to 0.2 s and observe its impact on P and A. Change active/apparent components values and observe the differences. Change input and change values of the transformer and observe the impact of values on the system. This can be your mini project for AC Electrical networks. You can also expand it as your basic power systems project.